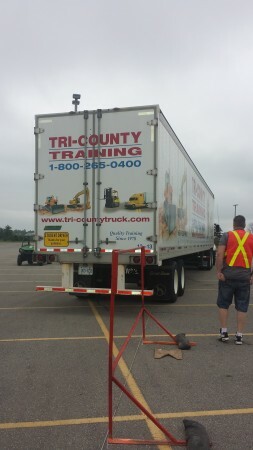 I could see the staged units from the 401: two sets of gleaming new B-trains donated by Home Hardware, a couple of Con-Way’s single-axles and pups, various Erb and Linamar trucks as well as some of Tri County Training’s 53-foot trailers spread across a few acres of parking lot at Conestoga College’s Cambridge campus. 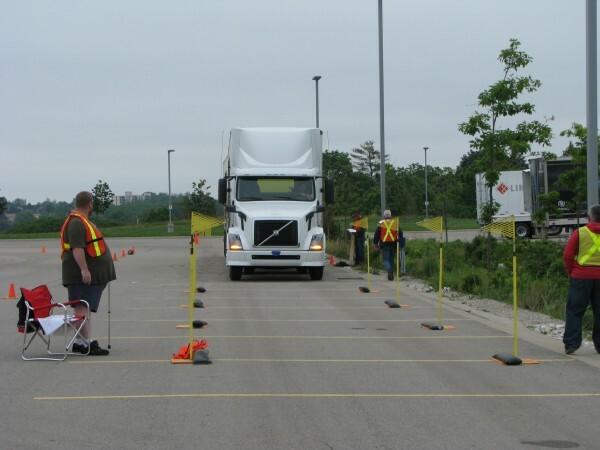 June is truck driving championships month across the country and the Central Ontario Truck Driving Championship (COTDC) is one of two regional competitions in this province (the other took place in Toronto the week before). This was the COTDC’s 30th anniversary and 33 contestants were competing in four classes, including several perennial champions along with one recent national champion. Contestant Clary Ward of Con-Way Freight in Hamilton won the single-single national title in Abbotsford, B.C. in 2013. His company appreciated his efforts and bought him a brand new Ford pick-up truck. How’s that for incentive and support? Registration began at 7 a.m. on an overcast Saturday, and the competitors and judges were milling about when I arrived. 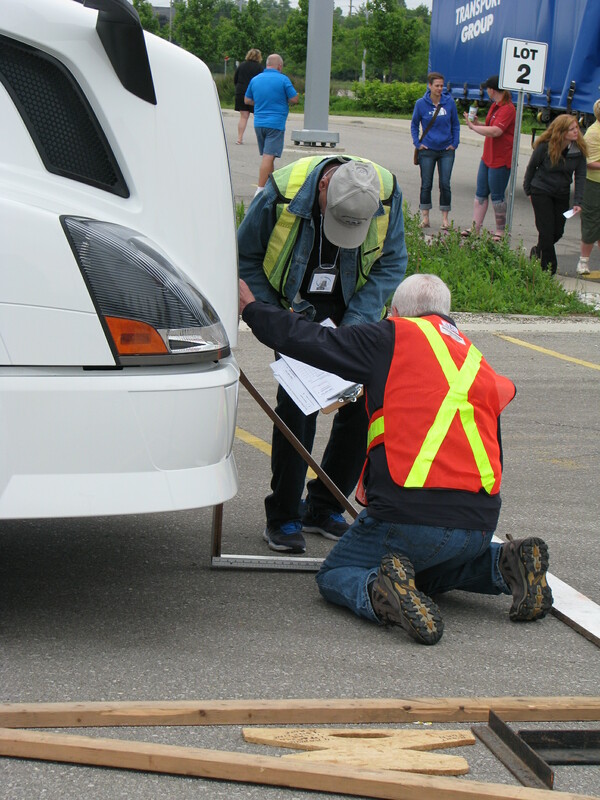 Setting up a championship like this involves dozens of volunteers and these are dedicated individuals who have a strong bond to the trucking industry (including one retired MTO officer). It was shaping up to be an interesting competition. A couple of Challenger guys who specialize in oversize loads, specifically windmill towers, had decided to try their hand in the tandem-tandem class. (John Weston of Challenger finished in second place and his colleague Jason Gray took sixth). Jeff Lambkin of Erb Transport comes every year and competes in the single-tandem category. He has finished second and third several times. Course marshal Tom Boehler arrived just before 8 a.m. and began rolling around the obstacle drums. Boehler is director of safety and compliance for Erb Transport, a major sponsor of this event, but he’s also instrumental in organizing the event year after year. 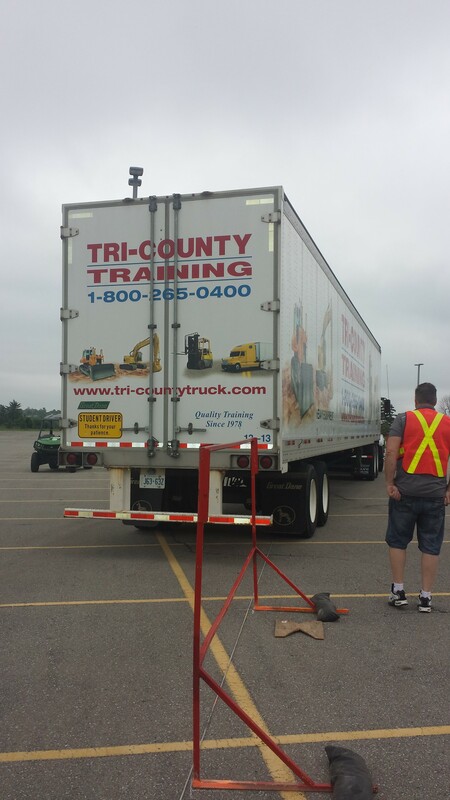 The competition involves a course with eight obstacles as well as a written test of 50 questions and a pre-trip inspection where the drivers search for planted defects. Each of the 10 events has a maximum possible score of 50 points and points are deducted as obstacles are touched or knocked over. These drivers are top performers, among the best in the industry, and winner of the tandem class, Shawn Matheson representing Home Hardware, scored 465 points out of a possible 500. By comparison, I finished 11th out of 14 contestants with 244 points. The companies that get involved in these championships go out of their way to make this a family event: kids, dogs and cheering sections arrived as the drivers were completing their written test. FedEx, Kriska, Home Hardware and Erb family members were putting up awnings as the drivers took to the course. The B-trains were on the tarmac first, followed by the single-axle and pup, and then the heavily contested tandem-tandem class. The COTDC draws contestants from west of the GTA along the 401 corridor to Windsor and the supporters are all stalwart sponsors: Home Hardware, GayLea Foods, Kriska, Erb, Linamar, FedEx, Challenger, JBT, Country Transport and I’ve probably missed a few. I was entered on behalf of Truck News but I’d been thinking about this competition for some time. In fact, I’d booked on as a “city float” for Purolator the last few weeks, squeezing into and out of some tight spots with a 53-ft. trailer, and driving exactly the same tractor as the new Volvos donated by Expressway Trucks. A Kriska driver told me he was doing something similar to get ready. “I stole a tractor and was practising backing into docks in our yard. The security guard couldn’t figure out what I was doing,” he said. Truckers are proud of their craft and a competition involving my peers is exciting to me. A couple of FedEx guys were in my division and I wanted to do as well as them. But I had a very serious problem: delusional confidence. Right off the bat, I misjudged the right-hand turn around a parked car and swung too wide with my button hook, contacting a barrel. So zero points for that one. But I managed to line up for the offset alleys and thought I’d gotten through clean but somehow lost four points – it must have been a miniscule nudge. Somewhat frustrated, I floated through the serpentine section and nailed another barrel, probably because I was going too quickly and had forgotten about the 14,000 lbs of dead weight in the nose of the Tri-County trailer, which might of affected the turning radius. A volunteer-judge was running over to move the drum, but I figured I might as well save him the effort and just knock it out of the way – sorry, Expressway. After flipping the trailer around 180 degrees to set it up for the alley stop, I notice the cameraman for Trucker Television out of the corner of my mirror picking up his tripod and hustling out of the way. Was I really that scary? Mine was definitely the quickest time, except there wasn’t any time limit. Only one point for the alley stop, but I did make it into a very tight dock that’s set up 70 feet from a pretend glass wall. The trick is to grab as much room beside the dock with the tractor and get the trailer started into the dock space before cutting the tractor hard to avoid the wall. I aced the diminishing walls section, which narrows from six inches clearance to two inches, but then I missed the bull’s eye on the next spot and ran over the stop line in the last section, scoring zero on both manoeuvres, so that was my day. So this has turned into a confessional, and I admit to driving like a jerk on the course. Most embarrassing I was even cautioned by the course marshal to keep it in second gear, flawed individual that I am. But setting my performance aside, this was a terrific competition with a very high skill level. Former national champ Clary Ward of Con-Way came in second in the single-pup category won by Joe Kuntz of Home Hardware. Another Con-Way driver Rick Dobie came in third with FedEx’s Martin Brodie from London, Ont., finishing fourth. Andrew Demerchant of Kitchener representing Flanagan Foods took first in the single-tandem class, and Wayne Burnett from Home Hardware took the regional title in the B-train division. Home Hardware drivers always do well at these events and true to form they went home with the team trophy, and their driver, Shawn Matheson, was named grand champion. 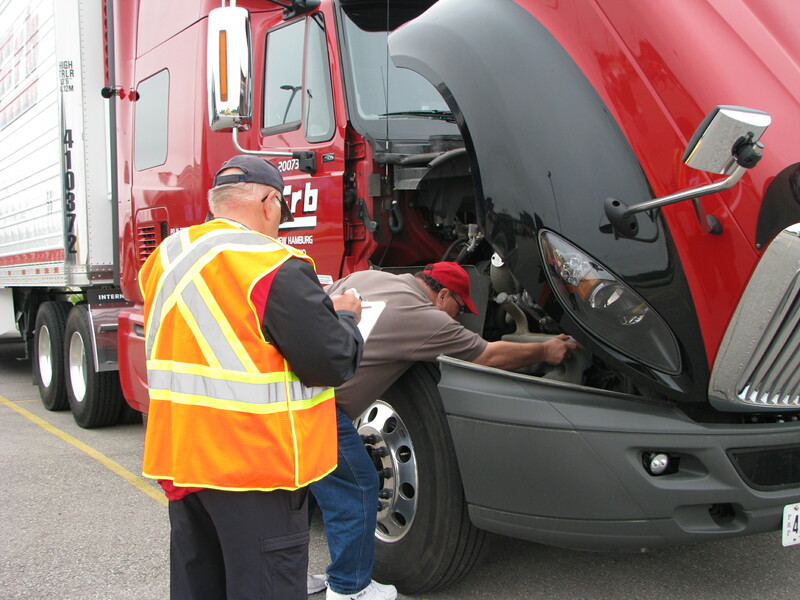 The first four drivers from each division advanced to the 69th annual Ontario Truck Driving Championships which will be held in London this year July 10-12. The winners from that competition go on to compete in the national championships, which are being held in Regina, Sask., Sept. 10-13. But the truly unique thing about the Ontario championships is the spirit of volunteerism that runs through the organization. While other provincial championships rely on help from their respective industry associations, the two regional championships in Ontario are entirely put together by volunteer boards. Even bigger events are planned for next year. According to Ontario Truck Driving Championships president Ewen Steele, 2016 is the 70th anniversary of the Ontario competition, and it’s going to be a pretty big deal. I’m hoping they could get the championships televised eventually. Like many people I enjoy watching lumberjack competitions, Canada’s Worst Driver, poker or darts on television, so why not Canada’s best truck driver? These are really interesting individuals with impeccable skills. It would make at least as interesting viewing as any of those other pseudo-reality shows. Better even, but there will have to be a time limit.